Do you hear the faint sounds of marching bands filling the air in your town? I heard that familiar drumbeat the other day walking through town and I almost jumped in the air and clicked my heels. I sure hope you’ve heard it, because like holiday bells, that will be your cue that the greatest time of year has officially arrived. College football season, to be exact. Yeah I know that thing they call the NFL is supposedly coming back on, but whatever. I’m talking about Saturdays, about Kirk Herbstreit and Chris Fowler and waking up to Gameday every Saturday morning so happy you just start giggling. 1. Enjoy college football, because it’s one of God’s graces to humanity. Athleticism? Sport? Cheering and yelling with friends? The ability for talented people to compete in a game that’s fun for millions of people? Gathering with friends around appetizers and nail-biter games? All grace. God is good and He gives us good gifts. I, for one, am thankful for His gift of college football. 2. Use college football as a tool for mission. Most definitely here in the South, and in many areas of our country, people eat up college football. I’ve lived in two southern college town/cities, and I know of nothing else that brings our culture together this much. So throw the best parties. Have good food and drinks. Invite your neighbors, your co-workers. It is a super easy way to be on mission with those around you. My 20-year-old self would hate me for saying this, but maybe even buy a big TV so people will want to hang out at your house. 3. College football makes a terrible idol. It will not make sense of your life. As ridiculous as this is, it’s something I’ve battled ever since I can remember. I grew up in Clemson, and my heart is attached to that place, to all the beautiful, beautiful orange and the rolling hills and ALL THE OTHER THINGS BECAUSE I LOVE THEM ALL. But it’s easy to make idols out of the things we love, to elevate them to an inappropriate place in our hearts, to turn to them for ultimate meaning and satisfaction. We love created things inappropriately and they break our hearts, because nothing can bear the weight of worship except the One who was made to carry it. Anything else will crumble, especially a group of 19-year-old athletes running around on a field. It’s tempting to get caught up in the story of your team, to think it is now your story–the thing that makes sense of your life. Which is ridiculous on so many levels, but still very much so a thing. I’ve come to realize that if a Clemson loss puts me in a bad mood the next day, my love is out of whack. It means that I’ve bought into the ridiculous lie that my story and very existence is justified by my team winning. That what a bunch of young boys do on a patch of grass somehow reflects upon the meaning of my life. But God–(are there two better words? )–offers us a MUCH larger, more beautiful, and compelling story and identity. We are His rescued and redeemed people, the ones He’s using to bring restoration and hope the the entire planet. Even Alabama’s current dynasty is a miserably pathetic alternative to that (much to the chagrin and shock of many Crimson Tide fans I’m sure). 4. Let’s be careful with rivalries. 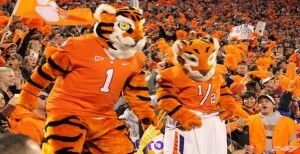 The other day I was behind a moped at a red light, and I looked up to see the driver wearing a shirt that said “The Year Clemson Went Down” and it had a tiger in a compromising position beside a Gamecock. You might expect other Christians to forgive you for such an asinine thing, but what about your non-Christian friends who are Clemson fans who now kind of hate you and may get a bad taste in their mouths every time they see you for the next year? Let’s remember that we represent Jesus, even on Facebook after a rivalry game. That’s all friends. These are mostly reminders for myself, and I assumed they might be helpful for someone out there. Love this perspective, thanks Klash! I know this may seem petty but hear my heart and know that more than anything else my desire is to keep the focus on giving Jesus Christ maximum glory. I would like to ask the praise team to not wear any Carolina or Clemson (or any sports team) shirts, pants etc. when leading worship. I know we have guests every week and we do not know the condition on their heart. If they are lost and a big Carolina or Clemson fan and they see their rival onstage, it may build a wall instead of offering a warm invitation to worship. I know that may be a petty attitude, but I don’t have to tell you how much hatred can stem from a heated rivalry. And the devil will do whatever he can to divide people and take away the unity that the church so desperately needs. I know this is a sacrifice for both Carolina and Clemson fans, but I believe the sacrifice will bring honor and glory to God. This is, of course, not a demand (I don’t have the authority to demand anything from anyone) just a simple request to prayer over as the team prepares to lead the WHOLE body in worship. Thanks for letting me share my heart and you are free to share this letter with the rest of the praise team. Thanks for chiming in Chet! Thank you so much for this article! I know it was written almost a year ago but I came across it when I googled Christian College Football Fans. I am an Alabama grad living in Auburn! You can imagine the stares I get…haha. I have struggled this past year with fans who either a. refuse to shop with me (I am a small business owner) because of my college football loyalty and b. those who take to facebook to post very hateful things. These are the same people I see post scripture Sunday-Friday or I see posting come to this church ect. I have struggled this past year with my faith and the college football hatred and rivalry has certainly not helped.The rivalry has gone to a another level and seeing very hateful post from people whom I view as strong Christian influences is a little disheartening to me. This year has been a struggle with me dealing with very earthly things like health and finances. I hope you don’t mind me sharing this message with my facebook friends. So many people don’t understand how their posts or actions effect others perception of Christians. Thank you again for your awesome post! Have a blessed day! Thanks Erin, I definitely understand. Really glad to hear that it encouraged you!